OPI Damone Roberts 1968 is a shade I've wanted to own ever since I first started blogging. The limited edition polish was created in collaboration with US eyebrow king Damone Roberts and is one of the prettiest green polishes I've seen. Back then I wasn't as crazy about polish so I never got around to getting it as I couldn't justify the price + shipping. I even did a post to see if anyone wanted to do a group order to split the costs but no takers sadly. But when I found out he was re-releasing the polish this year for the last time I HAD to own it even though it was double the price it was in 2009. I didn't care! 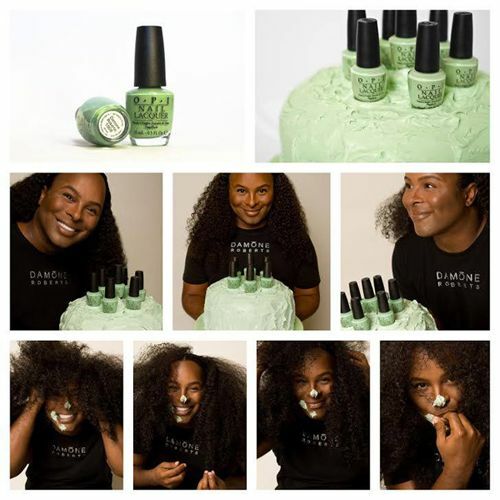 OPI's "Damone Roberts 1968" Nail Polish was created by OPI in 2009 to celebrate the brand...Damone Roberts. The color was matched directly from our Beverly Hills & New York Salon walls in an effort to bring the unique pistachio tone, described by Damone himself as "a different green with undertones of a soft grey, and a warm brown that works well on every skin tone". The masses seem to agree, as the color has sold out worldwide twice now. This polish is quite the hot commodity and bottles presently can be found on Ebay retailing for $75.00 each. We are proud to announce that OPI & Damone have teamed up for the third time to bring you a limited collector item quantity available Summer 2014. Damone Roberts 1968 is a soft mint green and having finally worn it myself now I know why it's such a sought after shade and I am totally and utterly in love with it. For starters the formula is ABSOLUTE perfection. Oh man I'm talking glides-on-so-smoothly-I-could-cry kind of buttery perfection. The shade has a gorgeous softness to it that I love and I think it would work well with most skintones. It dries quickly and to a high gloss shine. 2 beautifully even coats is pictured below. Details: Available from Damoneroberts.com and Damone Roberts salons in the US for $20US. Is there a polish you've wanted for years that you've finally had the chance to own? There are so many more on my list but baby steps to tick off the wishlist! Don't forget to enter my 4th blogivesary China Glaze Surprise collection giveaway! Oh man, after reading how good the formula is, I probably will have to shell out the money for it. I've been going back and forth because of how expensive it is but I'm really glad to hear that it's a great polish. Thanks for the review! *Gorgeous* color but yikes @ the resell price!